Introducing one of the most powerful yet easiest to use 200W/10A charging system ever! 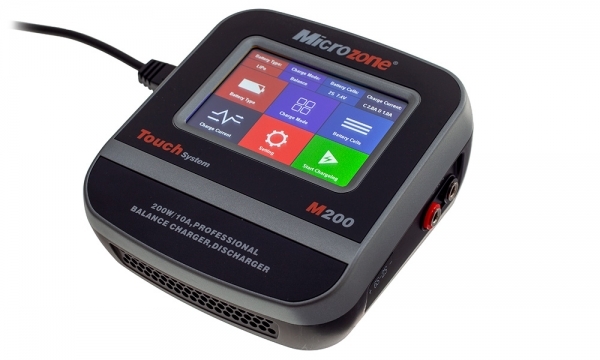 The Microzone M-200 packs the most advanced charging, discharging, maintenance controls into one small attractive and powerful unit! Gone are the days of pressing individual buttons to scroll through tough to read and confusing program menus. The M-200 uses a Touch Sensitive 3.5” Color LCD Screen which allows you to quickly switch from screen to screen to individually set your charging or discharging parameters! Color coded menus and easy to read letters! Extremely easy to use as you set your charger for your specific charging parameters! Included is a Balancing Paraboard with Four (4) XT60 and T Style battery connectors/Type XH balance plug ports! This system allows the capability to charge up to 4 lipos at the same time! (Please see detailed information for paraboard charging). Twin cooling fans keep the M-200 performing efficiently and quietly. Up to 200 Watts of output power and 10AMPS! Charge fast and charge with safe while the M-200 internal Microprocessor constantly monitors the battery level and individual cell voltage! Time to give your batteries a next level charging experience!